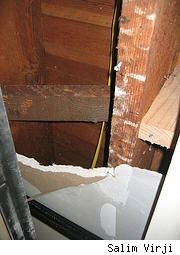 Owners of Florida homes built between 2004 and 2005 have discovered dangerous Chinese drywall to be behind heating and air conditioning system failures, as well as air quality issues in their homes. With the home building industry already in a tail spin, this latest fatal flaw is potentially impacting home values in a big way, as the Chinese drywall has been confirmed as the source of both home system failures and air quality issues. Imported and used in new construction during the Gulf Coast building boom of 2004-2005, the drywall was manufactured in China by Knauf Plasterboard (Tianjin) Co. Ltd. Domestically produced gypsum drywall is generally the first choice of U.S. builders, but supply shortages in the wake of Hurricane Katrina and lower prices ushered the Knauf product into many a new build. After a few years of mounting homeowner complaints, testing completed this month by both the manufacturer and high-volume builder Lennar Corp. has confirmed that the drywall is releasing sulfur-based gases that corrode air-conditioner coils, computer wiring and even metal picture frames hung on drywalled surfaces. As if that's not enough, there also an odor─a rotten-egg smell that's released when the drywall is cut into for repairs and structural investigations. The Florida Department of Health has tested these gaseous emissions and determined that they don't pose an "immediate health threat," but additional testing continues as homeowners worry about their families' health and the reduced resale potential of their homes. This Chinese drywall issue is limited to Florida, and Lennar is working with owners of its homes to conduct air quality tests and replace the offending product─a costly and involved process that often requires relocating homeowners during the repair period. Tom Kraeutler is the Home Improvement Editor for AOL and co-author of My Home, My Money Pit: Your Guide to Every Home Improvement Adventure. He delivers home remodeling tips each week as host of The Money Pit, a nationally syndicated home improvement radio program.